The Comedy Cafe is a great little project that merges the laid-back Berlin bar scene with international comedy. 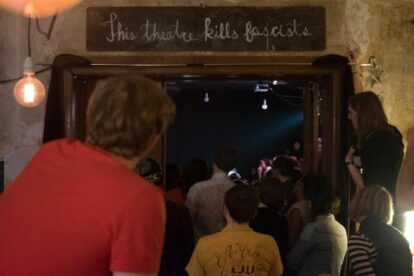 It’s small and low-key: not just a bar and not just a theater. It’s a meeting place for an ever-growing community of really fun, funny people. They are super-welcoming, and their doors are open to anyone with a good sense of humour. I do believe even if you don’t have one you will probably leave with one. Hah! Treat yourself to one of their many shows: stand-up, improv, jams, or take a class with them. They have a variety to choose from and they’re really good fun. I promise. But what I like most about the Comedy Cafe is not just that it’s based on laughter, but that it embraces the cosmopolitan aspects of true comedy. There are no cultural boundaries here. That stage is always filled with people from all over the world, doing their thing and trying something different. It’s inspiring, and addictive. Check out their website for their program and dive in. You need not speak German for most of them. But there are German options if you want. They also have really good beer on draft. Ding ding ding!